While many definitions of CPGs exist, common features of CPGs include the development of specific recommendations for practice using a transparent process that incorporates the best available evidence and the involvement of relevant stakeholders (Beauchamp, Drapeau & Dionne, 2015). 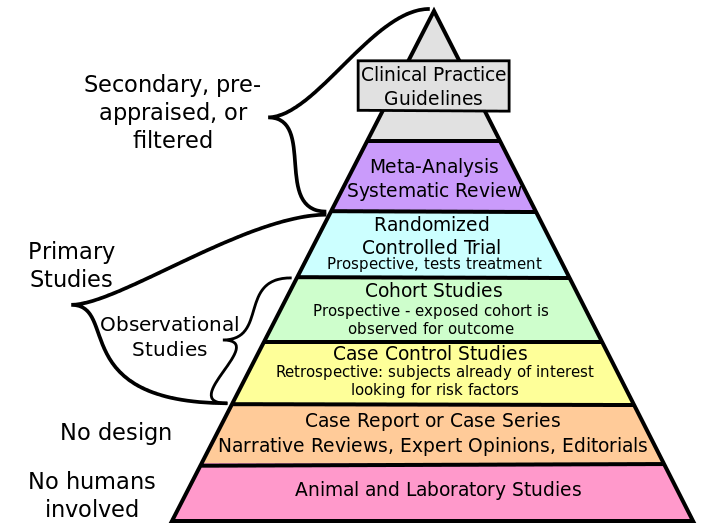 CPGs fulfill a range of purposes which include, but are not limited to: synthesizing the research in a given area in a way that supports clinical decision-making; helping to accelerate the translation of research findings into clinical practice; and informing both practitioners and consumers about what can reasonably be expected from a given intervention and highlighting potential challenges and risks associated with these. Image 1.1 Image By CFCF – Own work, CC BY-SA 4.0, https://commons.wikimedia.org/w/index.php?curid=42857470. Why should clinical psychologists care about CPGs? CPGs are frequently used by our colleagues in other professions and have been used by healthcare decision-makers to inform their choices around diverse topics, including accreditation, the allocation of resources and reimbursement of services. There are even cases where CPGs have been used in legal proceedings as a proxy for standards of practice. As CPGs become more ubiquitous in our healthcare environment, practicing psychologists need to be aware of the guidelines that may be relevant to their work. What has the clinical section CPG initiative done so far? The clinical section began looking at CPGs in 2014-2015, after this issue was highlighted in our review of past surveys of members and executive officers. In our section business meeting at the annual convention in 2015, we presented a proposal to use a portion of our budget surplus to develop a “hub” or “portal” to provide access to high-quality CPGs for psychologists. This proposal was supported and we formed a CPG working group to begin developing the site. The first step in this process was to conduct an environmental scan, to ensure that a comparable resource did not already exist. This was completed in the summer of 2015. Our scan revealed that while there are several resources that psychologists may use to access CPGs (you can find the full scan here) there currently is no single location that compiles CPGs for psychology that is accessible, comprehensive, authoritative and easy to use. Our next step was to conduct a needs assessment survey of our members, which we completed in the fall/winter of 2015. 198 individuals responded to the survey; 81% of this sample identified as members of the clinical section. 65% of our respondents indicated that they use CPGs at least some of the time, but several barriers to using CPGs were identified, including difficulties accessing CPGs, concerns about the relevance and appropriateness of CPGs to the practice environment and a preference to review the evidence firsthand (for more information about this survey, see our symposium presentation from the 2017 convention, here. However, one of the most prominent themes to emerge in the comments was concern about the quality of CPGs, and quality assessment emerged as a feature that psychologists would want to see in any CPG resource developed by the section. Concern about the quality of CPGs is warranted. For example, a recent review of 70 CPGs in the area of child and adolescent mental health found that 69% of guidelines that were assessed were developed using methods that did not align with established criteria for guideline development and lacked key features like mandatory rigorous systematic reviews, the inclusion of appropriate stakeholders in the review committee and transparent conflict of interest policies (Bennett et. al, 2015). Similar findings have been found by other research teams (e.g, Beauchamp, Drapeau & Dionne, 2015). Our original vision was to develop a “hub” or portal facilitating access to high-quality CPGs for psychology. 85% of survey respondents reported that they were somewhat or very likely to use a portal like this if this existed. What our review of this area so far has revealed, however, is that there is urgent work to be done related to the quality of CPGs, and that the scale of this work requires partnership and resources beyond what we currently have available. In February, 2017, the clinical section put out a call for individuals with relevant expertise to submit proposals related to CPGs that build on the work we have done to date. We are currently developing partnerships to help carry on these activities. Where can I find CPGs? How do I know if I can trust the CPGs I find? Is there an explicit description of development and funding processes that is publicly accessible? Do the authors follow a transparent process that aims to minimize bias, distortion, and conflicts of interest? Were the guidelines developed by a multidisciplinary panel comprising clinicians, methodological experts, and representatives, including a patient or consumer, of populations expected to be affected by the guideline? Does it use a rigorous systematic evidence review and consider quality, quantity, and consistency of the aggregate of available evidence? Does it summarize evidence (and evidentiary gaps) about potential benefits and harms relevant to each recommendation? Does it explain the parts that values, opinion, theory, and clinical experience play in deriving recommendations? Does it provide a rating of the level of confidence in the evidence underpinning each recommendation and a rating of the strength of each recommendation? Has it undergone extensive external review that includes an open period for public comment? Is there a mechanism for revision when new evidence becomes available? There are several instruments that have been developed to help individuals and groups assess the quality of CPGs. We have included links to two of the most commonly used below. http://www.apa.org/practice/guidelines/evaluating.aspx. APA is also working on developing their own CPGs. The Guidelines International Network (http://www.g-i-n.net/) is currently working on developing consensus around minimal standards for guideline development. Access to APA stuff such as books, documents, statements and many psychology resources. The Anxiety Panic internet resource, a grass roots project involving thousands of people interested in anxiety disorders such as panic attacks, phobias, shyness, generalized anxiety, obsessive-compulsive behavior and post traumatic stress, is a self-help network dedicated to the overcoming and cure of overwhelming anxiety." Material on the phenomena of anxiety, its treatment, support groups, designed primarily for those looking for help, there is something for the professional as well. Good presentation. The Psychiatry journal of the American Medical Association contains: Current issue table of contents and Past issues of the Archives, both of which provide links to abstracts; and Psychiatry-related links on the AMA site. An interdisciplinary professional society … to ensure that everyone affected by child abuse and neglect receives the best possible professional response ." "a modern framework to bring together all fields of health research…"
" a broadly conceived interdisciplinary journal whose main function is to stimulate and communicate research and theory on the role of cognitive processes in human adaptation and adjustment. It attempts to integrate such diverse areas of psychology as clinical, cognitive, counseling developmental, experimental, learning, personality, and social. The journal publishes experimental studies, theoretical articles, review articles, technical articles, methodological articles, case studies, and brief reports. … published by Plenum Press." The Centre for Evidence-based Medicine’s home page. Nice presentation. Obviously a work in progress. Look for CATs: "The CATbank will be a creation, storage and retrieval facility for a collection of CATs (CriticallyAppraised Topics)." The focus is on continuing medical education in mental health. One can ask experts, participate in chat rooms, access articles and a variety of CE resources, as well as get information on the various psychiatric disorders. A mental health Professional Directory and Classified section are attached. Many links. A grass roots, self-help, support and advocacy organization dedicated to improving the lives of people with severe mental illness and their loved ones. NAMI strives to reduce stigma and ignorance of severe mental illness to help eliminate discrimination and restrictions on access to essential treatments and life supports such as employment, housing, health insurance, and social contact. Membership page. Conferences/Events page. The Helpline Online is an information and referral service. A volunteer at that number can talk with you about mental illnesses and the medications that treat them, as well as provide information on brain disorders. Web site of the International Journal of Psychiatry. Much access to psychiatric resources, a feature is the peer-reviewed journal Psychiatry On-Line, papers of which are archived here. Links to companion journals: Child & Adolescent Psychiatry OnLine, Forensic Psychiatry OnLine, ECT OnLine, Transcultural Mental Health OnLine. One can also "Buy It OnLine": order books, CD-Roms, tapes, and videos from Priory Book Shops. The Public Affairs Office of the American Psychological Association has prepared several brochures to provide information on mental health and psychological issues that face us all. They’re collected into topical groups of work, family and the mind-body connection. You’ll also find a list here of state and provincial psychological associations, many of which offer referrals for mental health services, as well as a link to association ethics documents. "This treatment guideline for mental health services is truly amazing in terms of the partnerships involved in developing and supporting the guideline. Backed by the UK Department of Health, representatives from British psychology, psychiatry, counselling, and other mental health organizations worked together to reach evidence-based agreement on services for a range of adult disorders. The full guideline and a brief version are downloadable in pdf format." The Society for a Science of Clinical Psychology is a section of Division 12 (Section III) of the American Psychological Association. Its purpose is to affirm and continue to promote the integration of the scientist and the practitioner in training, research, and applied endeavors. Its members represent a diversity of interests and theoretical orientations. The common bond of the membership is a commitment to empirical validation of clinical procedures. The archives of the SSCP newsletter Clinical Science is available on-line. Also available, the Division 12 Task Force on Psychological Interventions Document Archive and the "Manuals for empirically supported treatments: 1998 update." Tourette Syndrome: "Life’s A Twitch"
"Through personal and professional experience, Life’s A Twitch! offers presentations, writings, research, resources, songs, a chat room, and encouragement to those living with Tourette Syndrome from B. Duncan McKinlay."